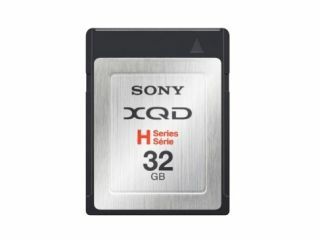 Sony is the first manufacturer to offer the new XQD memory card format. The format, which was announced at the end of 2011, is set to rival Compact Flash in pro-end cameras, offering unrivalled fast read and write speeds of 125MB/sec. Nikon's D4 pro DSLR, which was also announced today, will be the first DSLR to use the new format, with the camera boasting dual slots for both XQD and more traditional Compact Flash formats. Sony claims that the new memory cards are able to store up to 100 frames when shooting in raw during continuous shooting mode. Initially, the cards will be available in two sizes, 16GB and 32GB. A USB 3.0 card reader will also be available. Getting hold of the new format won't be cheap. The 16GB card has a listing price of around $129.99 (c. £83), with the higher format 32GB coming in at $229 (c. £147). The USB reader will set you back $44.99 (c. £28). By comparison, 32GB CompactFlash cards can be picked up for as little as £35, but of course as with any new technology, prices are likely to drop as time progresses and the format gets more widely adopted by other manufacturers. Several other companies, including Canon and Panasonic have expressed an interest in supporting the new format.